Why send an elaborate info sheet when you can just as well tell your audience that your new album is out, and that it is great? 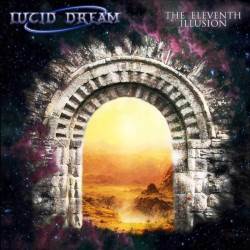 This simple yet very self-confident approach made me curious about Italian hard rock / heavy metal band Lucid Dream. The quartet from Genoa self-released their debut Visions From Cosmos 11 in 2011, and are back two years later with the follow-up The Eleventh Illusion. Like the first time, the quartet is working without the help of a record label. The Eleventh Illusion starts with the Italian spoken word intro The Gates Of Shadow, performed by a woman they are referring to as their High Priestess. She later also speaks the non music outro The Way Of 7M. As Italian is not one of the languages I master, and the English lyrics of the regular songs are also rather cryptic, I can’t really go into the concept of the album, but I guess it is something science fictional with mystical undertones. The important thing though is the music, and there Lucid Dream are convincing. Especially the first half of the album can be considered a future classic, as the band is displaying all their different facets on the first four tracks. Evolution is a no-frills rocker which combines the best of Eighties party rock with Seventies retro rock. If you think that there are progressive undertones, you are not mistaken. The following Leave Me Alone is still a straightforward rock track, but the high shrieking vocals reminded me instantly of Geddy Lee, giving this track a mid-Seventies Rush flair. River Drained comes that close to being a cheesy ballad, but the authentic production always keeps it afloat, and then you don’t even mind the mellow saxophone part either. You have to be really good to pull something like this off without losing your face. The album’s highlight comes with The Lightseeker, an eight minute epic piece of music that shows the quartet from its most diverse and progressive side. Just dive in and enjoy! The final half of the album is still very good, but can’t quite keep up with what preceded. The Seventies hard rocking Back To Cosmos 11 might be a nod to the band’s first longplayer, and hints that the number 11 seems to be very important in their overall concept. Then something strange happens: the next three tracks (Connections, Two Suns In The Sunrise, The Song Of The Beyond) take up ten minutes with really mellow moods, taking somewhat the momentum out of the music, even though the middle track is very good. To make up for these quieter pieces, the band offers two heavier tracks: Black and The Eleventh Illusion, where the Italians remind me more of Fates Warning than of Rush. And that was the regular part of the album, which ends with the pleasantly meditative The Pulse Of Infinity, an experimental ambient solo track by guitarist Simone Terigi, and the aforementioned spoken word outro. Lucid Dream have proven once again that you don’t need a record label behind your back to allow you to make great music. Especially the first half of The Eleventh Illusion is superb, and even the second half has its share of truly strong moments. Fans of Seventies hard rock that don’t mind a discreet progressive touch shouldn’t hesitate to get their hands on a copy of this exceptional album.